It has been great to see Barry Sherbeck’s photographs of the Sanctuary environmental art exhibit. This is currently on display at the Overture Center in Madison, WI. Here is a Link to the exhibition. At a rental cabin up north we noticed peculiar birds climbing down the trees – the nut hatch. That family like mine found rest and security in our woodland homes. We had rented a hillside cabin for a week’s rest. It was a rambling house set into the hill. The owners appeared to be bird lovers as there were a number of feeders off of the deck, hanging among the trees. A variety of birds came and went, along with one very acrobatic squirrel. But the birds that caught our attention were small ones with pointed beaks. What was unique about them is that they were usually looking downward as they climbed in the trees. We learned that they are nut hatches, whose unusual view of the world arises from looking for food from the top down. They find what other birds do not see. It seems as if the human family in our temporary home, perching on the hill, had much in common with the nut hatch family outside our window. I have taken a piece of found wood from where I live near Nine Springs in Madison, because it had a large knot suitable for a nest. I gathered some dry grass nearby and constructed a nest from it. The nut hatches on the piece are stylized, but I am trying to capture their jaunty pose. 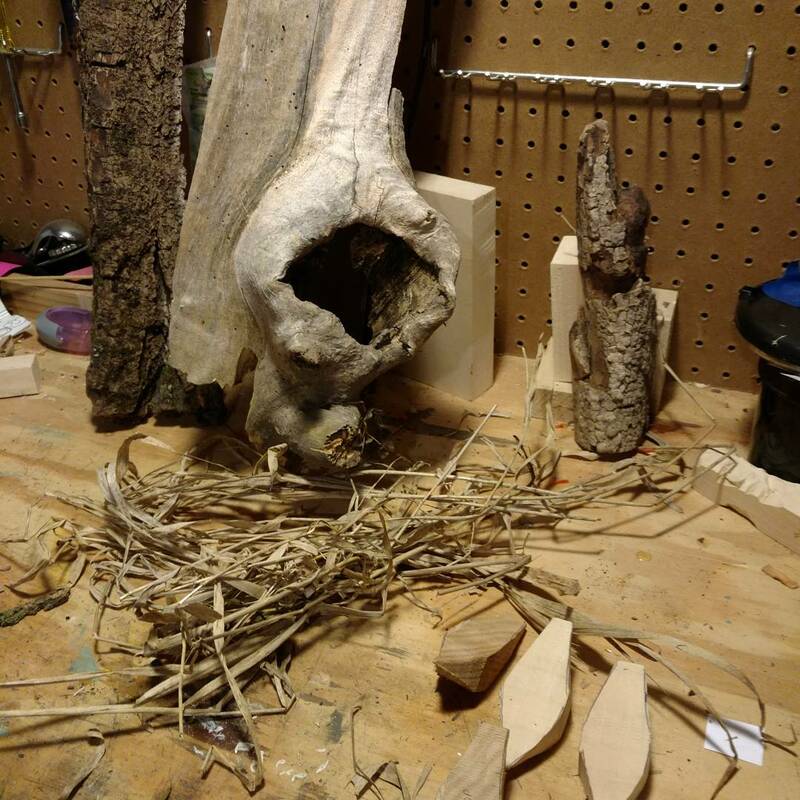 The challenge of this environmental art project is the finish of the piece. Wood is natural, but often wood carvers use paints and stains that are unnatural and even possibly toxic. So then I have used mineral oil to seal the pieces, natural stains where needed, and used hidden dowels and a milk based glue to attach the nut hatches to the piece. The challenge is also the charm of this kind of art; I expect that the piece will age somewhat quickly on location. Art again follows the course of nature and all things. We find sanctuary together, not divided. I have finished “The Seer” in time for the show at Bethel Lutheran Church in Madison. The concept was to think about the long hope of the ancient Hebrew believers. This is the head of a prophet. Another word for prophet is “Seer”. I think of this as Isaiah, because we read so much from Isaiah in the Advent Season. The prophet sees in the distant sky a star, representing the hope for redemption. His white hair and beard show that the wait was long. The star prefigures the Christmas Star found in Matthew 2. And I like to think of the Magi, star gazers, as being on the other end of the message. The Seer lives in hope and the Magi set out on a journey of discovery. 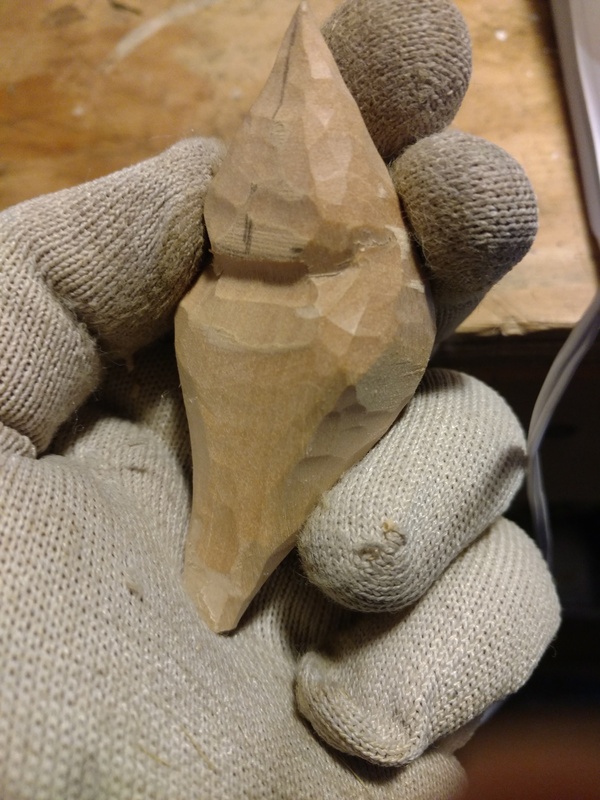 Here are some images of the process of the carving. I used a method of shallow relief. The wood is butternut. The piece is 27 x 17 inches and about 3/4 inch thick. I left the living edge because the wood itself has a story of growth over years and bark for enduring the elements. I have been thinking about a carving that suggests Hope in Advent. I went through a lot of very complicated iterations until I hit on the idea of the Prophet as Seer, looking into the night sky to see a special star. The prophet will have a long lyrical beard, suggesting time. 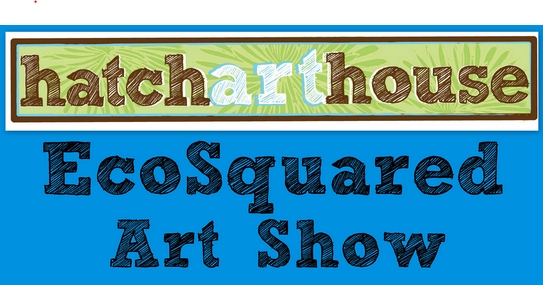 I submitted two carvings to the Eco Squared show at Hatch Art House on Willy Street here in Madison. The art is to contain upcycled or recycled elements. I took some of the wood I received at the Urban Forest Fest. 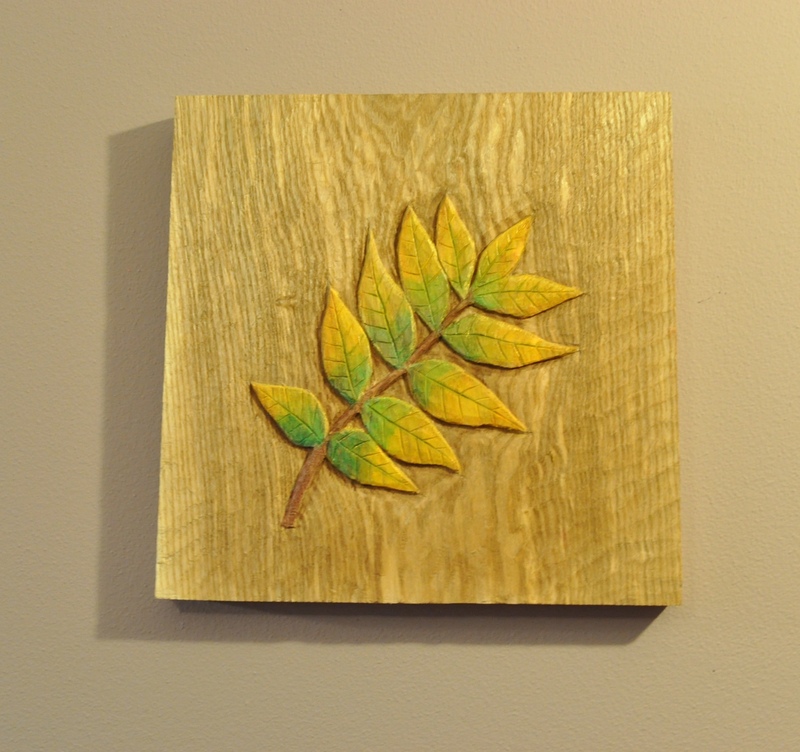 This is a slab of wood cut from an Ash tree that was knocked down by a tornado. Ash us a very strong and fibrous wood, not typically used in carving. I discovered that it can be carved while it is still green. 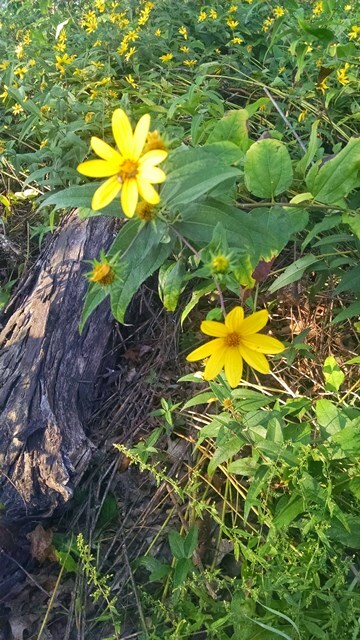 In hardwoods, it counts as green for the first year or so. 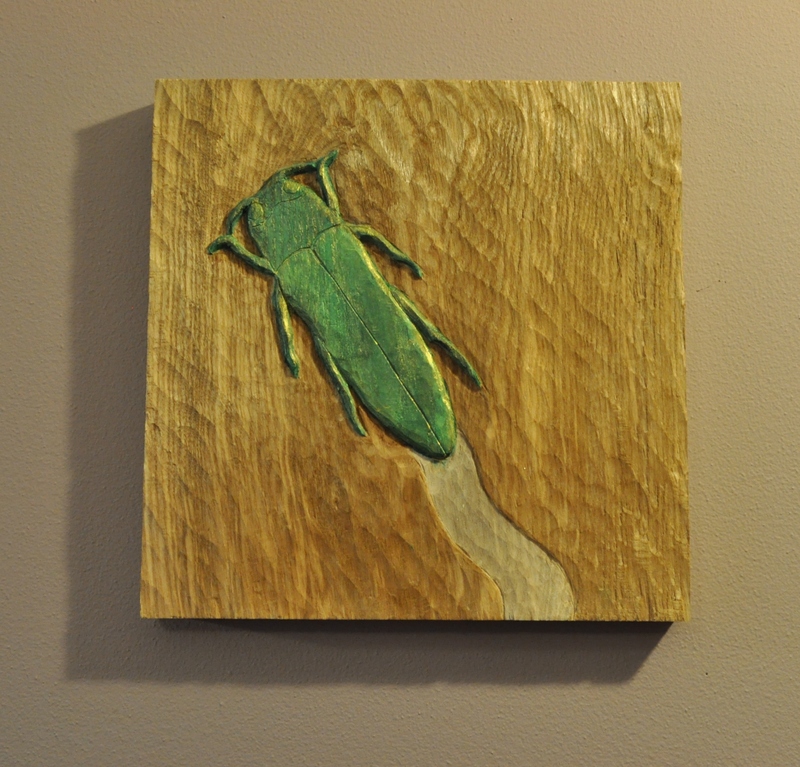 The two pieces I submitted are an ash branch showing fall colors and the second is of the emerald ash borer. The irony of the insect is that it is quite a lovely intruder as bugs go. Showing at Hatch Art House starting January 9. Opening reception January 9 from 6-9pm. It started with a summer storm. Severe winds tore through the East side of Madison and downed a number of trees. Three of these were saved and taken to the Urban Wood Fest to show how fallen wood can be saved and used. That is where I acquired a slab of ash. This tree came from Hudson Park which features a burial mound. As I walked around the park, I saw other trees, and the mound crowded with prairie plants, carefully not mown down by the city parks workers. An ancient tribe came here and built these mounds, we are not sure what for exactly. Another park nearby has a bear and a lynx mound. The one at Hudson is not easily identifiable. Just as these visitors found something to commemorate, I remember a previous visit along the shore. We were canoeing between the Yahara and Olbrich park when we saw a blue heron along the shoreline. 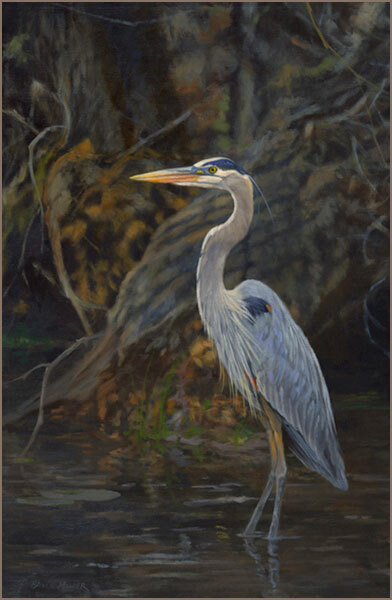 I was able to find photographs of the blue heron and so developed this design. I chose to represent the heron in shallow relief, and to develop the color and life of the bird with several layers of thinned acrylic paint. This is the result. I think it is a fitting use for the ash wood that was blown into my way.